No kidding, no joking, the 2018 Dodge Challenger SRT Demon puts out 840 horsepower at the wheels. 840! For reference, a 2017 Indy car puts out around 700 horsepower. A NASCAR stocker puts out 725 horsepower. A world Rally Car puts out 315 horsepower. A Le Mans prototype will put out around 900 horsepower, but that’s combined output for both the internal combustion engine and the hybrid drive system. The current Ferrari F1 car puts out around 1,000, but that’s also the combined total of the internal combustion engine and hybrid drive system. So I will repeat myself: The 2018 Dodge Challenger SRT Demon puts out 840 horsepower at the wheels. 840! And Dodge will sell the 2018 Dodge Challenger SRT Demon to literally anyone. Anyone. No background check. No psychological profile assessment. You got a ominous twitch in your left eye, my friend? Don’t matter. Anyone. For the love of Horace and John, even me. Me! 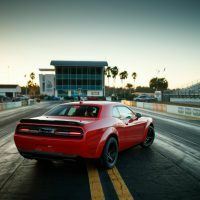 The Challenger SRT Demon is equipped with a set of Nitto NT05R street-legal, drag-race tires, a first for a production car. The 315/40R18 tires were specifically designed for the SRT Demon, with a new compound and sidewall construction. 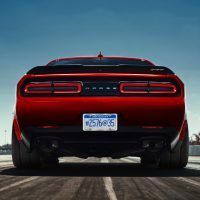 The drag radials give the SRT Demon a 15 percent larger tire contact patch and more than twice the grip of the Challenger SRT Hellcat. The sticky drag tires are mounted on lightweight 11×18-inch wheels, with each tire measuring 12.6 inches wide. Furthermore, a unique rear knuckle reduces negative camber by 0.5 degrees, “standing up” the tire and increasing the size of the tire contact patch. Photo: FCA US LLC. 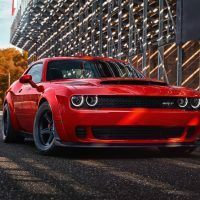 At 840 horsepower and 770 lb-ft. of torque, the Dodge Challenger SRT Demon is the most powerful muscle car ever thanks to its supercharged 6.2-liter HEMI Demon V8 engine. Let that sink in. Next time some old gearhead tells you about “the good old days” and how crazy muscle cars were in the late 60s, remember this Dodge has almost 900 horsepower. To my direct knowledge, right off the showroom floor, things like Superstock Darts were in the mid-500 range. This thing puts out 340 horsepower on top of that. 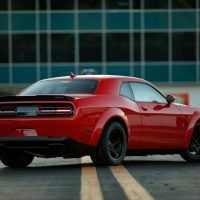 Not only is this the highest horsepower V8 production engine ever produced, and I mean ever, the Demon is also the first production car to have a certified front wheel lift from a dead stop. And by lift, I mean it was measured at 2.92 feet, and by certified I mean certified by Guinness World Records. This is a car that, from the factory, directly off the showroom floor, can pull a friggin’ wheelie! 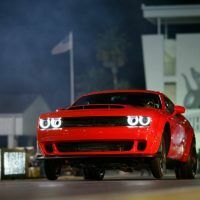 The 2018 Dodge Challenger SRT Demon was designed to cover the quarter mile as quickly as possible. To do this, it combines both mechanical and electronic tuning for maximum launch grip while still maintaining directional control. 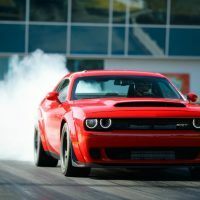 The Bilstein Adaptive Damping shocks have been tuned for drag racing, shifting as much weight as possible on the rear tires at launch for maximum traction, and improving rear tire grip by 11 percent. 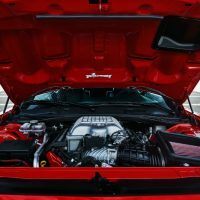 Weight shift in the Challenger SRT Demon is aided by softening up some key suspension components like the springs and sway bars. Photo: FCA US LLC. Want to know the ET this thing pulls at the strip? 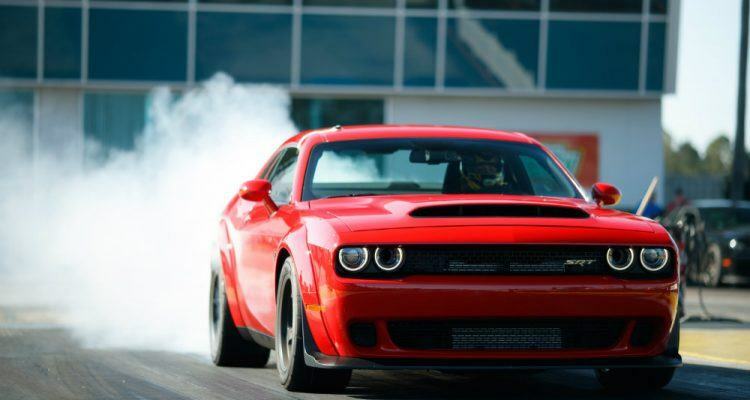 This: 9.65 seconds at 140 miles per hour as certified by the National Hot Rod Association. That is slightly faster then the aforementioned Superstock Dart, and I guarantee the Demon is both heavier and better equipped than a Superstock Dart. 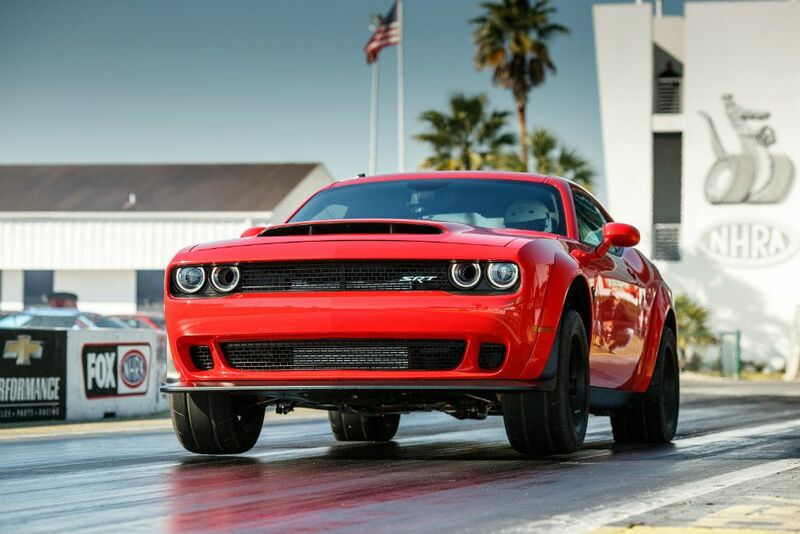 Oh, and this makes the Demon the world’s fastest quarter-mile production car. Not a La Ferrari, not a Porsche 918, not a Veyron, a Dodge. A Dodge. However, if you’re thinking of taking your new Dodge Demon down to the strip on Grudge Night so you can finally make Steve from accounting shut up, forget about it. 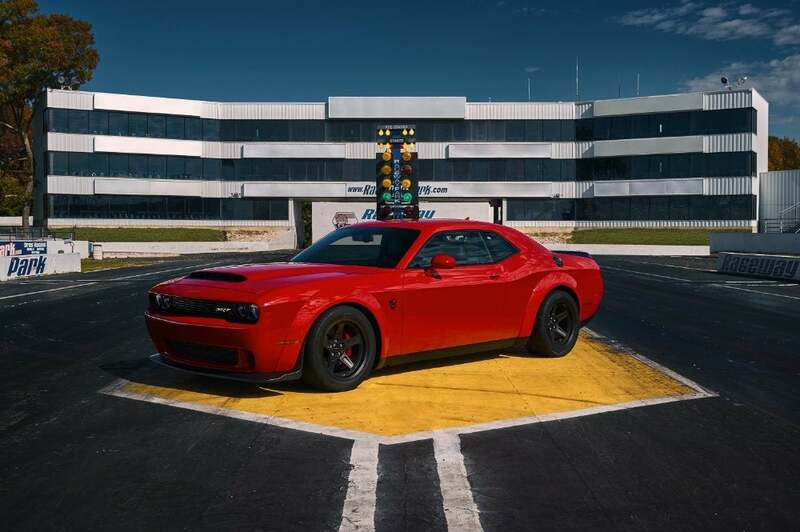 The Challenger SRT Demon was deemed too fast for the drag strip and officially banned by NHRA. The Demon is also the world’s fastest 0 to 60 production car, with 60 mph coming up in 2.3 seconds and 0-30 happening in a single second. A single second! 2.3 seconds to 60 is quicker than Formula cars I’ve driven. It’s faster than my old pro-rally car by a long shot. 2.3 is retina-detaching fast. Throw away the stop watch, and measure it in G-force, and the Demon pulls at 1.8 g, or about 60% of the space shuttle at launch. That is, in case you’re curious, the highest g-force acceleration of any production car. The 2018 Dodge Challenger SRT Demon will be available 14 exterior colors: B5 Blue, Billet Silver, Destroyer Grey, F8 Green, Go Mango, Granite Crystal, Indigo Blue, Maximum Steel, Octane Red, Pitch Black, Plum Crazy, TorRed, White Knuckle, and Yellow Jacket. Photo: FCA US LLC. 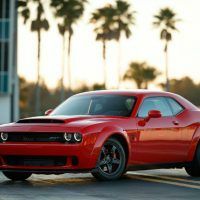 The 2018 Dodge Challenger SRT Demon also has the largest functional hood scoop of any production car at 45.2 square inches. Dodge calls it the Air-Grabber induction system, but sadly, unlike the Air-Grabbers of old, this one is not variable, nor does it feature those totally wicked teeth like a P-41 Warhawk. It’s more like the big gaping maw from the fiberglass hoods of the Superstock Darts and Coronets. All 45.2 square inches of that Air-Grabber induction system are very, very functional in feeding what can only be considered a leviathan of an engine. The forced-induction system reads like it was pulled off a World War II fighter plane. The Air-Grabber hood is sealed to the air box, which is also fed from the driver’s side Air-Catcher headlamp and an inlet near the wheel liner. 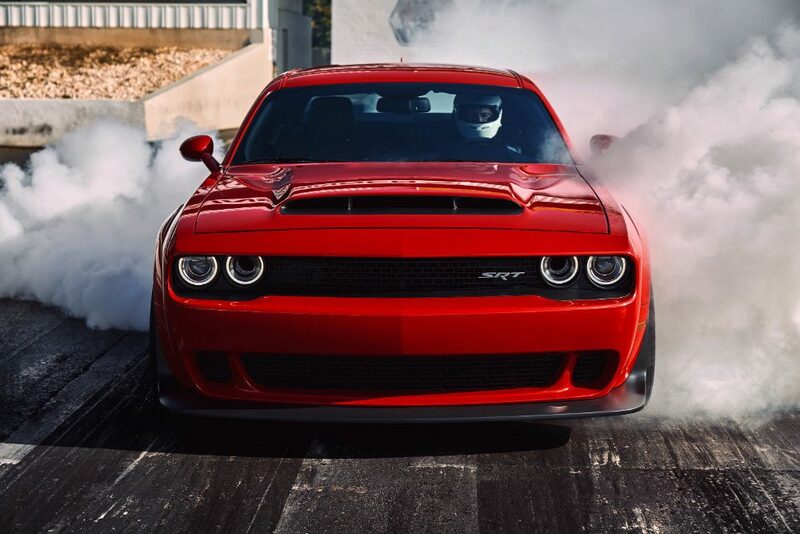 Combined, those sources give the Demon an air-flow rate of 1,150 cubic feet per minute, 18 percent greater than the Hellcat. 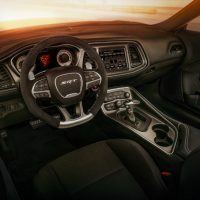 The additional air inlets help reduce the temperature of the intake air by more than 30 degrees compared to the Hellcat, which improves throttle response. Photo: FCA US LLC. 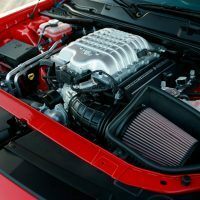 The supercharger is a larger 2.7-liter displacement blower that gives an increased boost pressure of 14.5 psi and a higher rpm limit of 6,500. 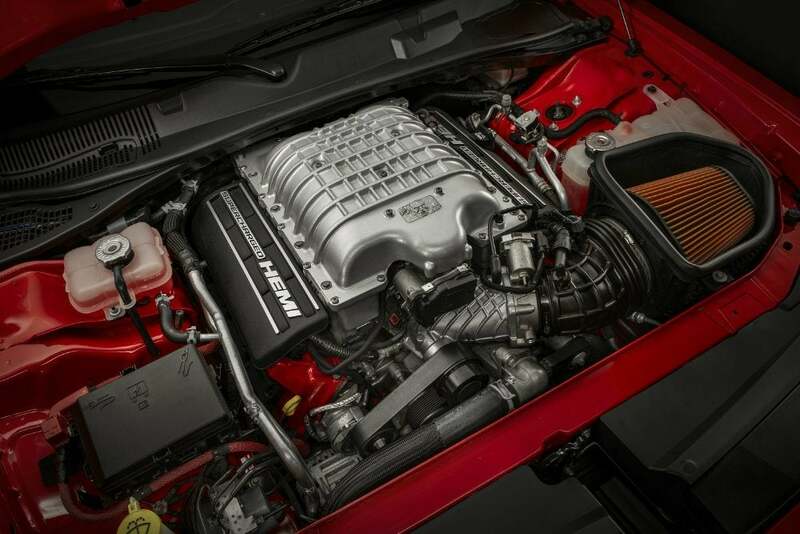 The supercharger alone displaces 2.7-liters. That is nearly a third bigger than the engine in a Miata, and that’s not even the engine! That’s what feeds the engine. The Demon’s supercharger features an innovative SRT Power Chiller liquid-to-air intercooler system, a factory-production car first. The liquid-to-air intercooler set up has an After-Run Chiller that keeps cooling the supercharger/charge air cooler after the engine is shut off, another factory-production car first. The Demon’s mill is designed to run on 100+ high-octane unleaded fuel or 91 octane on demand. Now, you don’t have to be J. Robert Oppenheimer to put 2 and 2 together here and figure out that all of the shocking performance figures are probably coming from a tank full of 100+ high-octane unleaded fuel, and not the lower grade stuff, but still, it’s nice of Dodge to at least give you the option of not having to swing by the local air base to gas up. The Demon engine has been certified to the SAE J1349 industry standard for its horsepower and torque ratings. 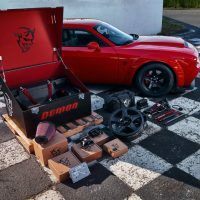 While the Demon engine shares similar traits with the Hellcat engine, it does have 25 major component upgrades including the supercharger, pistons, rods, valve train, and fuel injection system. The engine also meets all applicable legal emissions regulations. Photo: FCA US LLC. And the goodies continue on down the drivetrain. 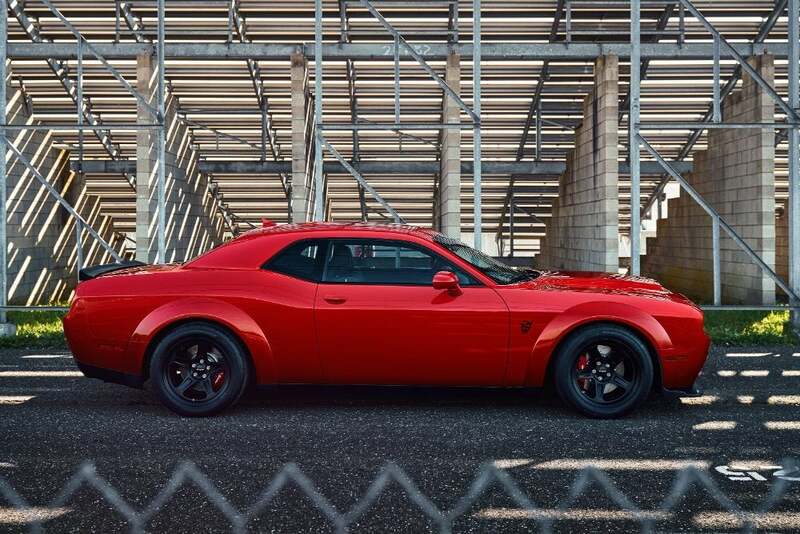 The Demon is the first-ever, factory-production car with a TransBrake for more powerful and quicker launches. This is an old drag racer trick that allows you to lock the driveline south of the engine, build up the revs and all that sweet, sweet torque and then let’er go in one big BWOOMFF. Also to that end, the Demon is the first production car with Torque Reserve to supply augmented levels of power and torque at launch. And this, this has got to be my favorite goodie for the 2018 Dodge Challenger SRT Demon: First production car with front passenger seat delete. That’s right, no passenger seat. Just me and 840 of my closest equine friends out to drain the color from the faces of BMW owners at the next stop light. 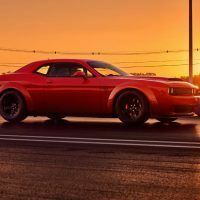 The 2018 Dodge Challenger SRT Demon will be a limited-edition, single model year production run of 3,000 cars for the United States and 300 Canada. Dealership deliveries begin this fall so get in line now. Now-now-now-now-now! Oh, and get this: The car is covered by a full factory warranty. 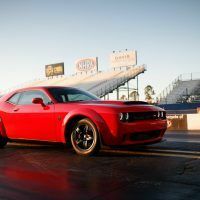 And if you are one of the few, the happy few who obtain the new 2018 Dodge Challenger SRT Demon, Dodge is also going to throw in a session at Bob Bondurant School of High-performance Driving. Take them up on this offer. Really. 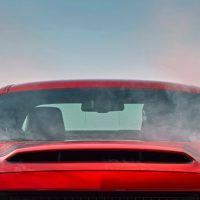 Production of the 2018 Dodge Challenger SRT Demon begins later this year at FCA’s Brampton, Ontario Assembly. Currently, this monster of a car is on display at the New York International Auto Show, April 14th through the 23rd at the Jacob Javits Convention Center. 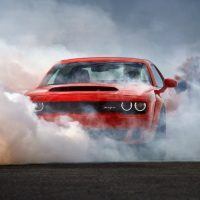 No Comments on "2018 Dodge Challenger SRT Demon Awakens"